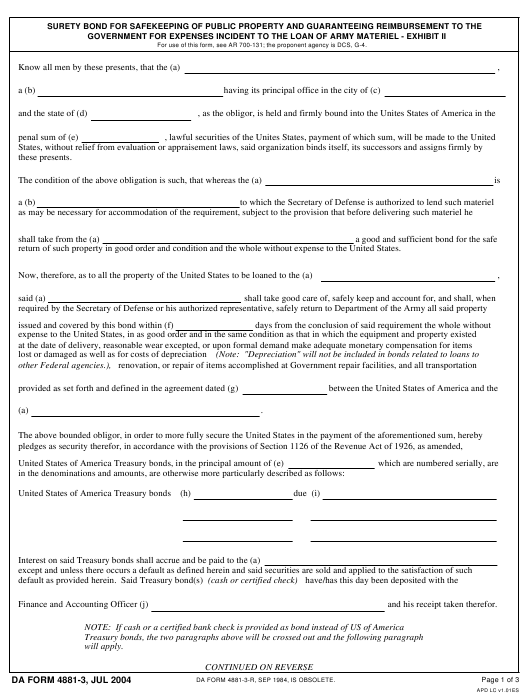 DA Form 4881-3 - also known as the "Surety Bond For Safekeeping Of Public Property And Guaranteeing Reimbursement To The Government For Expenses Incident To The Loan Of Army Materiel - Exhibit Ii" - is a United States Military form issued by the Department of the Army. The form - often mistakenly referred to as the DD form 4881-3 - was last revised on June 1, 2004. Download an up-to-date fillable PDF version of the DA 4881-3 down below or look it up on the Army Publishing Directorate website. return of such property in good order and condition and the whole without expense to the United States. and his receipt taken therefor. DA FORM 4881-3-R, SEP 1984, IS OBSOLETE. thereof, in case of any default in the performance of any of the above named conditions or stipulations. acknowledged the execution of the foregoing bond. borrowed the Army materiel, or is providing the bond. government, corporation (Boy Scouts of America), etc. (c) Enter the name of the city. (d) Enter the name of the State. (e) Enter the amount of the bond. (f) Enter the number of days, or period, for which loan of the materiel is authorized. (g) Enter the date on which the loan agreement between the borrower and the US Government was signed. (h) Enter rate of interest paid on the bonds. (i) Enter date on which bonds are due for redemption. which the servicing Finance and Accounting Office is located. (k) Enter date on which bond is signed. (l) Enter month in which bond is signed. (m) Enter year in which bond is signed. (o) Enter, if appropriate, the names and title of the comptroller or treasurer of the borrowing activity. (p) Enter name of person witnessing signature. (q) Enter address of person witnessing signature. (r) Enter the name of the county in which the power of attorney is being signed. (s) Enter the name of the State in which the Power of Attorney is being signed. (t) Enter name of borrowing activity's chief executive. (u) Enter date on which the power of attorney is signed. (v) Enter month in which the power of attorney is signed. (w) Enter year in which power of attorney is signed. (x) Signature of Notary Public. (y) Enter date that the Notary Public's commission expires.